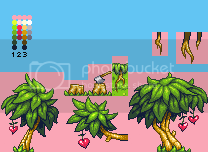 These are a few tiles I've been working off and on with for a while now, you may have seem a bit of them before, but I figured I should make a serious go at a thread about them, since I work on them quite often. Hopefully I'll have sprites, animations and the whole mock-up-works here for you to crit etc. ->Everything is WIP and subject to lots of changes. #1 is where I started off, I wanted it to be the bouncy happy field/hilly area where main chars always seem to start off and kill the easiest bad guys.. However I think I will focus on making it more of a jungle of hilly thorn-area. or be able to work for all three depending on the badguys and BGs. #2 is kind of your basic rock and grass area, and so I think it'll be the starter zone. Ive noticed that it doesn't really have to same kind of layout as the other tilesets, so I have to correct that, also going to make it more shadowy at the bottom. 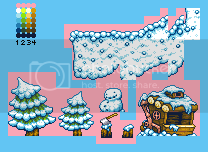 The anims are tests, but as you can see with the snow level i might have the little cabin guy live in every area and sell you weapons, or juts say 'hey!' all the time. #3 snow level. pretty straight forward, its the newest eddition, so more BG obects etc to come. also experimenting with a BG scene for it. 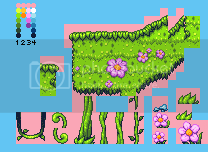 #4 was originally meant to be background extras for tileset #1 only, but now I'm not sure, I'll use it somewhere.. I might animate the little heart-shaped fruits to sway in the breeze a little. -having trouble making backgrounds, I'll post my wips soon. love the flowers but the small snow balls in 3 seem out of place? The only flaw I see is the cabin walls look a bit flat; the front wall should be lighter than the one to the left. psycho_carp: I'm assuming you mean the ones in that aren't at the top? ya, i used to have waay more, and got rid of some, i'll check out what it looks like without them at all and see. atomicMushroom: Thanks! do you mean the snow cabin or the #2 cabin? Felt like fixing up the rock tiles first, since they had a different setup than the other tiles. So i'm making them conform and look better. worked on the bottom yesterday. might add a bit more shadow below the grass, and also look at removing the tiny stone that obviously repeats midway down, or see how it looks with another basic tile. ...and i will get to the crits about the snow raised earlier :) my mind just fixed on this set.